In 2017 I launched a new line for Jemima & Co. It's beautiful padded letters: custom made to treasure for ever. They come in two sizes - 20cm (8") high and 10cm (4") high, and in a wide range of fabrics. They can stand alone or hang on a wall (picture hooks attached). They can be made to complement one of my rag dolls, or to embellish any room in your home. 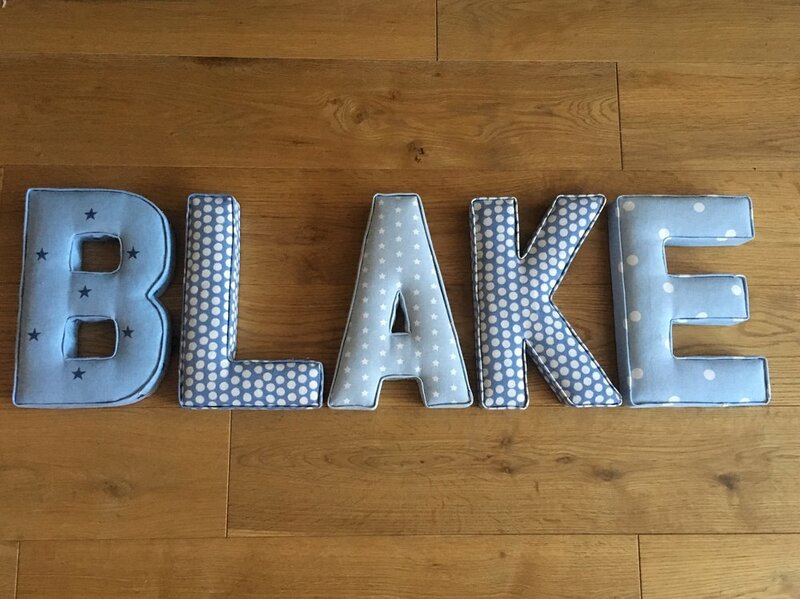 Padded letters make a wonderful focal point at a party, wedding, or any special occasion or event. The possibilities are endless!! 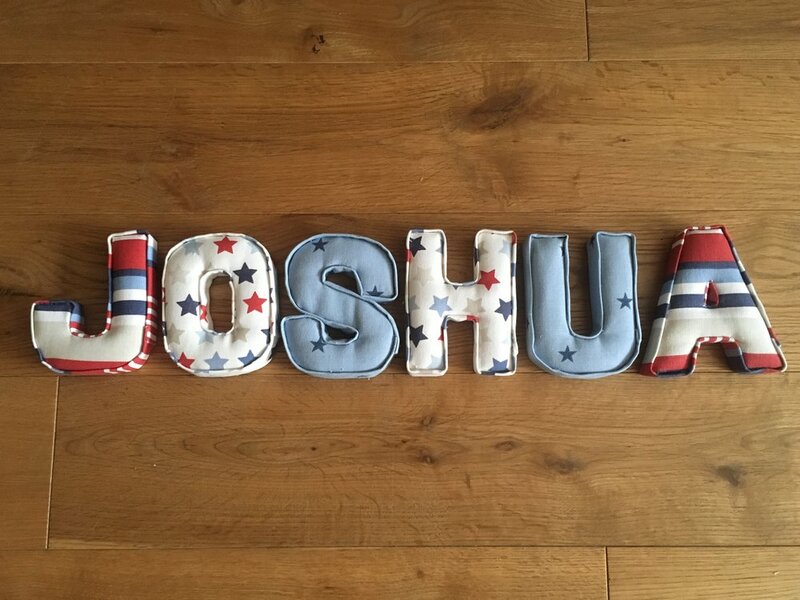 Choose a full name or initials, discuss your choice of fabric with me and I'll make your custom order. I will make your letters as soon as your request is made, and I aim to ensure you receive them within two weeks maximum - in most cases, much sooner. If you order letters for a specific event such as a birthday and therefore need them by a specific date, please order well in advance. I will, of course, make every effort to fulfil the order in good time. Christmas orders should be made by the end of November - or contact me with a special request. 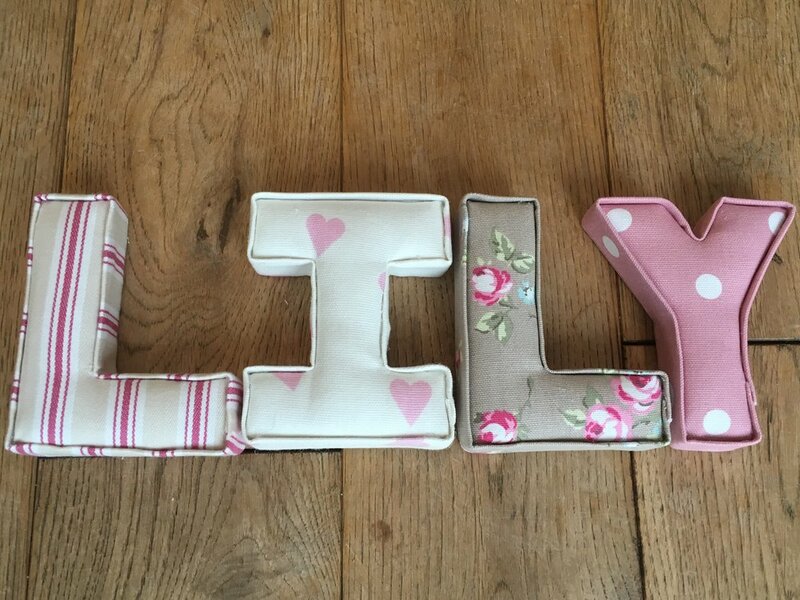 Prices for my letters are £9.50 for large letters, £6.50 for small letters (plus p&p). I will make a payment request via PayPal when the letters are completed and you have seen photos of the finished letters. (or you can send me a cheque, or make a bank transfer, if you live in the UK). I will post your letters to you by 'signed for' delivery when payment has been received. Go to the Padded Letters Gallery for lots of pics of my lovely letters to inspire you and give you ideas! You can see the range of fabrics I have available for padded letters if you go to the Shop page and click on the spotty fabric icon . The whole menu will then open up. Have a look at the fabrics available and make a note of the code number for each fabric you choose. Then email me with your choice. The colours are not always absolutely true on the menu, so feel free to request photos of them before ordering. If you're not sure what fabric combination to choose, email me and I'll send photos of possible combinations in your preferred colour scheme to help you decide. If you live in the UK and you're unsure whether the fabrics will match your colour scheme, contact me with your postal address and I will happily send you a swatch or swatches.